I went to a minor league ballgame today, and had a lovely time. Our guys won, the other pitcher had a horrible day -- throwing into the dirt left and right, and on one occasion losing a ball in the air as it fell behind him, picking it up, and then dropping it, so our guy got on base when by all rights he shouldn't have -- and I shook hands with our team's mascot. Also, I had beer and a bratwurst dog while sitting in the sun on a gorgeous day, and these are pleasures not to be underrated. The best hit of the game was taken by the umpire, when a foul ball nailed her right in the chest protector. The thump echoed all over the stadium, but she didn't even flinch. I have never cared for the majors, but I love minor league and college ball with a deep and abiding warmth. This probably has something to do with my memories of going to minor league ball with my father when I was a small boy -- childhood pleasures seem to grow as the years pass -- but I think it also has to do with the fact that the stakes are lower, so it feels more like a game to me. Though I've enjoyed the horse racing I've seen, and that's not exactly a low-rent sport. So who knows? 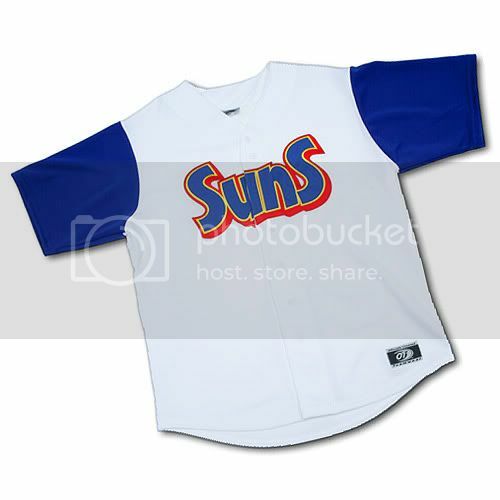 A side note: I thought of neonhummingbird and butterflykiki and crew during the game, because our team is called the Suns, and this is their jersey. Put me in mind of fannish days of yore, it did. Excellent! It looks even more like the Mark I logo. :) Good to know the SunS achieved immortality (or at least eternal infamy).